A few days ago, I posted about the various artworks found on Boston's subway system. Some of them are hidden or hard-to-spot, while others are in plain view. Today, I take you on a close-up tour of the Red Line, and invite you to try your hand at identifying the art installations with the photos at which they are found. Here's how it'll work: below are 24 photos of 24 different art works. Some of them are relatively wide-view, but several are pretty close up. I tried to find interesting angles and specific details that aren't necessarily apparent right off the bat, so look closely! None of the stations are on the Ashmont/Mattapan branch (ie. between Savin Hill and Mattapan on the map at left). No, I'm not being Ashmontist, I legitimately couldn't find much on that portion of the line. If I'm missing something there, please let me know! Remember, some installations are outside the stations. Answers will be posted sometime during the week of February 7th-11th, as will the larger pictures in their specific contexts. Ready? And......go! It's winter, it's cold, it's nasty, and our chalk is stowed safely away for the drier months and cleaner pavement. And with it, we ourselves are resting woefully inside, twiddling our thumbs listlessly. Right? Artisan's Asylum, in coordination with the Somerville Art Council's ArtsUnion Winter Series, is happy to announce that this Saturday will be a day of hilarious public snow art. The city will be providing a giant pile of snow (courtesy of the snow storm on Wednesday) and a bunch of shovels, and Cantina La Mexicana will be providing Mexican h...ot chocolate! All we have to do is make big displays of public art around the square. No problem, right? Grab your gloves and jackets and come help us build snow forts, scenes from Calvin & Hobbes, elaborate snow sculpture and anything else you can imagine! Even if you don't have an idea for an art piece, come by anyway and help us lug massive amounts of snow around the square. If you want to bring stuff, bring shovels, trowels, buckets, and any other snow-shaping tools you can imagine. 1-4pm. It's free and open to all ages! To get there by MBTA bus: 85 from Kendall; 86 from Sullivan, Harvard or Cleveland Circle; 87 from Lechmere; 91 from Central; or the CT2. For more information and to RSVP (not necessary, but it never hurts), check out the facebook event page. Read more: Marching Brass Bands invade Boston! On Friday, September 17, four parking spaces on Harvard Street in Coolidge Corner will be transformed into mini-parks as part of an international effort which hopes to "transform metered parking spots into temporary parks for the public good." Sponsored by several organizations within Brookline, this is a free, public event, so all are invited to participate in games, laze about on the grass, or even relax "in a beach chair and dangle their toes in the water" (all in a parking space? Awesome!). The concept of transforming an existing space into something unexpected and unconventional might seem familiar to BSOS veterans, for the very same theme undercuts so many of our past spectacles, such as Riding the Subway is a Beach, where we brought the unexpected sight of beachbound vacationers to the cold, March underbelly of Boston. 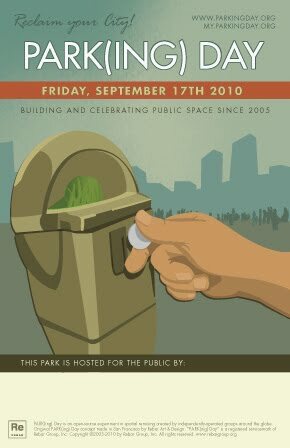 With Park(ing) Day, the goal is to invite passersby to re-imagine the allocation of our public spaces. And, of course, to enjoy a day in the literal park! Wanna go? Send us a photo of yourself lounging in one of the "parks," send it to us, and earn points on your BSOS account! For more information on Park(ing) Day in Brookline, check it out at Brookline Perspective. -Via Public Transportation*: Green Line, C branch to Coolidge Corner, or 66 bus from Harvard, Allston or Dudley. *because wouldn't it be sadly ironic if you drove? Pursuant to our eternal quest to seek new methods of creative expression, we recently decided to try a new approach for passersby to use as they help us cover the pavement with color. Instead of just giving them a stick of chalk and letting them run free with ideas, we filled a jar with little pieces of paper, each of which had a short pre-written prompt which they could use as inspiration. We avoided simplicity and straightforwardness in our prompts, opting instead to leave ample room for interpretation and creativity. So, for example, rather than writing simply "a purple monkey," we might re-phrase it to something like "a simian enraged by his frustrating evening commute."